State and local officials Monday marked the restoration and rededication of the George B. Stevenson Dam at Sinnemahoning State Park in Cameron County. By controlling, the reservoirs in the comprehensive four-dam initiative provide significant flood prevention to the towns downstream. Among other state officials joining the DCNR secretary were Richard D. Flinn Jr., director, Pennsylvania Emergency Management Agency; Marcus Brown, director, Pennsylvania Homeland Security; Roger Adams, acting director, Bureau of Waterways Engineering and Wetlands, Department of Environmental Protection; and Scott Dunkelberger, deputy secretary, Department of Community and Economic Development. Before the dam was built, the surrounding valley and downstream watershed saw several catastrophic floods, claiming life and land. Its high-hazard classification implies there is potential risk for significant property damage or loss of life downstream, should a breach occur. This classification is determined by the storage volume of the impoundment, the height of the dam, and the potential extent of personal and economic loss, if the dam were to fail. Included in the wide-ranging, two-pronged project, costing almost $12.2 million and started in 2011, were electrical, sensor, siren and computer upgrades; toe drain and filter improvements; dredging, stream realignment, and shoreline stabilization. 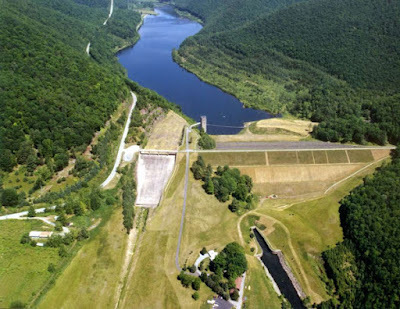 In addition to the safety and well-being of those living downstream from the reservoir outflow, visitors to the state park, one of many enriching the Pennsylvania Wilds, also share in the rewards of these projects. Sediment removal and dredging in the upper half of the lake increases water depth in the lake for fishing and boating. In hand with sediment dredging, stream alignment and shoreline stabilization projects were completed while the lake level was down.